Ok, this card is an A2 size card: 4 1/4" x 5 1/2". Love this size! So, let's get right to business, so you know how I made it, and you can use some of these techniques yourself. I added a purposefully sloppy double border with my sewing machine. [I love this look.] I added some sponging on top of the stitching, to help them 'pop'. 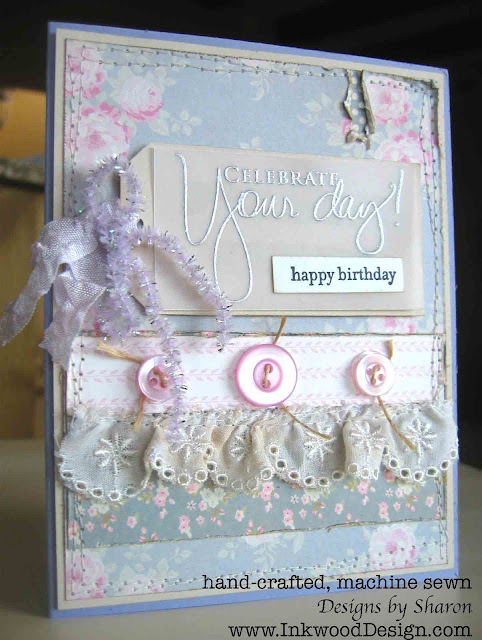 I had a scrap piece of white cotton trim that was tea dyed, so I stitched that piece onto the front of the card too. I strung kraft twine through a trio of lavender moon vintage buttons by PaperTrey Ink and adhered them to the pink leaf pattern paper. I kept the twine long on purpose. 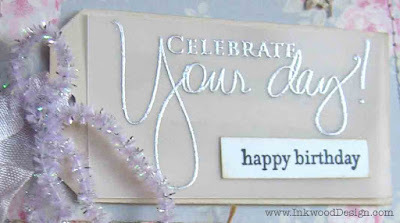 My sentiment was created with heat embossing and simple stamping. I stamped the sentiment in versa mark onto vellum card stock and added silver embossing powder and heat embossed. 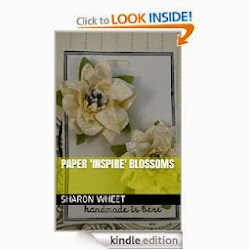 I just love how soft and elegant the silver embossing looks. 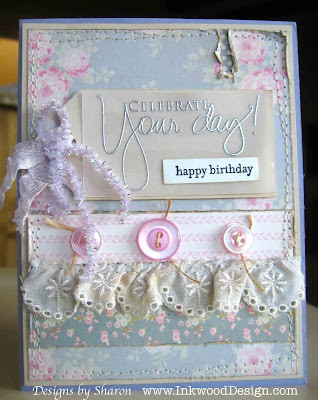 I used the hand script stamp set by PaperTrey Ink. I added my adhesive to the back of the vellum piece where the sentiment is to help 'hide' the adhesive, which can be seen through this semi-translucent card stock. I stamped the 'happy birthday' onto whisper white card stock in basic black classic ink, using Teeny Tiny wishes stamp set by Stampin' Up!. Then I fussy cut the sentiment and adhered it to the vellum piece. I added a gift card to the inside of the card. That way, my mom can celebrate HER day, anyway she wants: shopping, dining, relaxing at the spa, or simply going to afternoon tea with girlfriends. Happy Birthday MOM! I hope your day is fabulous and you get a chance to do what your heart desires. Love you! 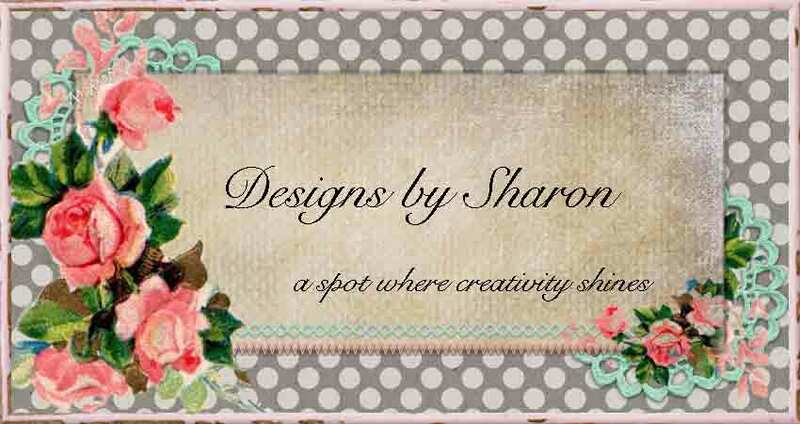 Thank you for stopping by and taking a moment to look at what I have been creating! Enjoy your day! and come back soon. I'll be sharing more.